It also can't be obtained by normal methods apparently. Probably event exclusive or demo exclusive like Ash-Greninja. The language is very vague though. Maybe it can be obtained in game but it's just super convoluted or at a extremely specific time. 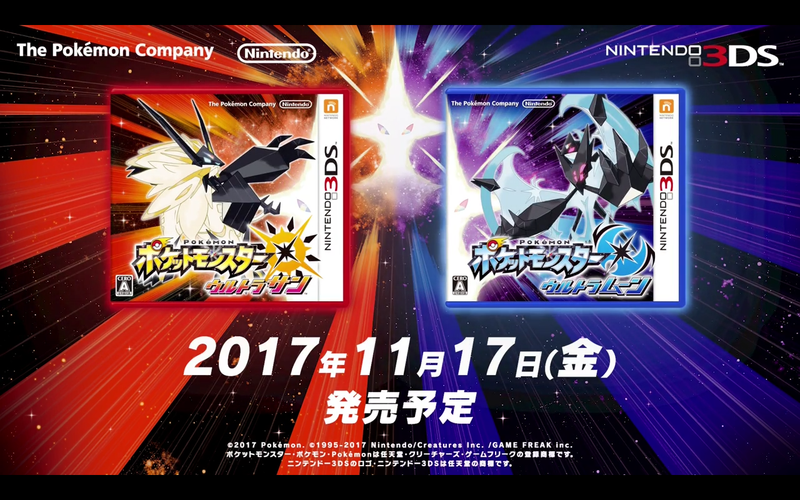 Some things to note: Between the box arts, there seems to be some new, glowing Pokemon. Likely Necrozma without its armor. The trailer also shows a room that looks a lot like Lt. Surge's gym. -Two new Necrozma forms where it takes over Solgaleo or Lunala depending on your version. -TWO NEW ULTRA BEASTS. Codenamed Burst and Assembly. They look really weird, which is awesome. Burst is Ultra Sun exclusive and Assembly is exclusive to Ultra Moon. -Mantine is a new ride Pokemon. Maybe as a substitute for the Dive HM? -People have noted that Rockruff's dex number is changed, likely hinting at an expanded regional pokedex which, quite frankly, is needed. -New areas like a beach with surfboards and a Pikachu park. They better have the National dex back. What a step back that was. 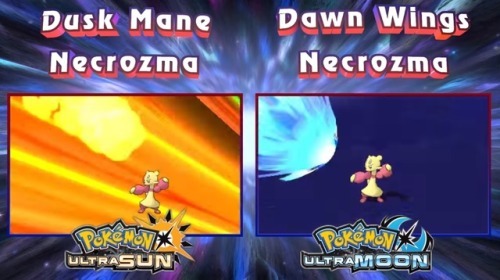 It's unprecedented that there are new Pokemon introduced within the same Generation, with the new Ultra Beasts being shown. Previously it was either new Forms or Mega Evolutions, which aren't the same because they typically require an external item to use, but this time, it's actual new Pokemon that can be used and presumably be captured. That sounds amazing, but I can't help but feel that they will be obsolete in the older games, unless they somehow made an update in the original Sun and Moon to allow them. I predict that Assembly will be Rock/Ghost and the Burst will be Normal/Ghost, because 1) I would like to see more Ghost-types, and 2) I feel they fit the Ghost-type. Here's hoping. -New trials. Mina actually has one now, which is nice. It looks like several old ones have been changed. Alolan Marowak is a Totem Pokemon now. -Regional dex expanded to over 400 Pokemon! Some new additions include Tropius, Volcarona line, Ampharos line, Tyranitar line, Zoroark line, Houndoom line, and the Manectric line. -Mantine is a new PokeRide pokemon. It can be used for a surfing minigame and also to surf between the islands! I hope the new PokeDex has Pumpkaboo and Gourgeist, since you can't even get their HA on all of their sizes. It's not so significant, but that would basically make all the HA Pokemon from past generations possible to get. If possible, I do hope that as the last Pokemon game (probably) on the 3DS, they make the Festival Plaza less cumbersome to use, as in, the connection is automatically made without the need to keep connection. I guess it's difficult to do due to the processing power required (I am surprised by how much the battery drains when I play this game! ), but for the sake of convenience, this should be a feature. Trailer looks sick. I hope it means what it's implying and the Ultra Beasts have a larger impact on the story. I think they're such a cool idea and I want more done with them. Bizarre, otherworldly creatures arriving in Alola and wreaking havoc and you the Champion must assume the role as protector of the region against these things. Such a cool concept, but very weak execution. Another new trailer. 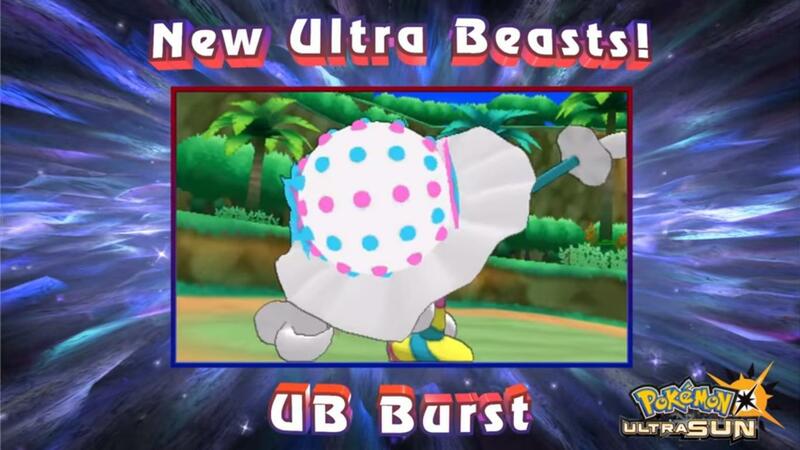 There's a new Ultra Beast that's pure poison, UB Adhesive. We can also travel to Ultra Space and battle the beasts there, and it seems like there's also a new faction of people dedicated to the UBs. UB Burst is confirmed to be Fire / Ghost and UB Assembly is Rock / Steel. At first I was worried these would be too similar to SM, but now I'm really hyped. Shame on Assembly's garbage typing. Was hoping for Rock/Ghost. Expected Burst to be Fairy, but I'm hyped that it's ghost-type. New team looks cool, guessing they have blue skin due to being in the Ultra Space for years. You know unpopular opinion maybe, but I'm not a fan of these Ultra Beasts. 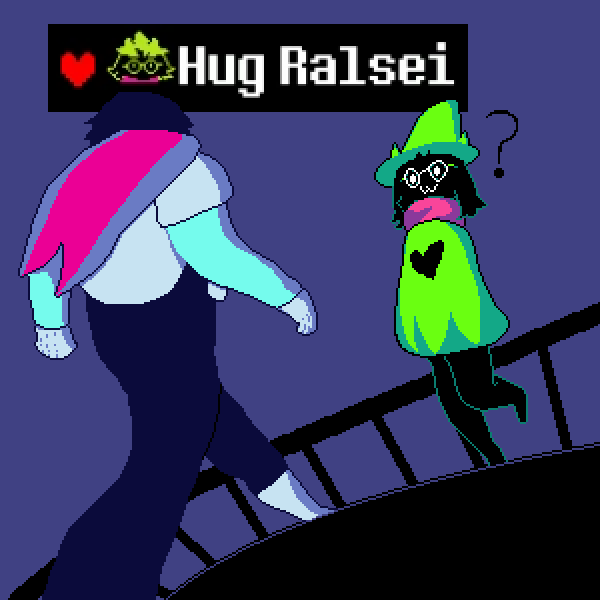 Wasn't in the original S/M and still not here. They're just so jarring to me so seeing how this game seems to focus on them more, it makes me even less excited sadly. See, I'm of the opposite opinion. I love how unpokémon they look. They're essentially aliens from another dimension. I would have gone a step farther and actually made them uncatchable and have absurd stats. That way they'd be bosses that would require whole teams of Pokémon to subdue. I love the idea of these overwhelming monsters appearing and you have to defend Alola. I just like the idea that we're capturing creatures who are in fact not pokemon. Looks like UB-Burst is Fire/Ghost and UB-Assembly is Rock/Steel. I was hoping that they will both be Ghost-types with unused combinations (Normal/Ghost and Rock/Ghost respectively), but I think their stats might be the most interesting part. I have doubts that Assembly will do great since Rock/Steel has traditionally been a very difficult type to use effectively, with Aggron being the best due to its high Attack. UB-Adhesive is another Poison-type. I thought it would be the first "legendary" Poison-type, but I remembered that Nihilego preceded it.